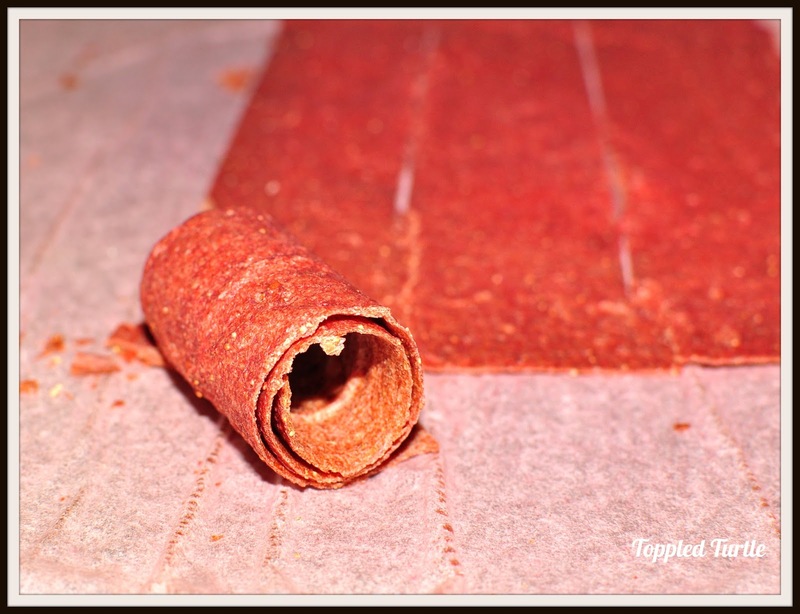 Toppled Turtle: Easy Homemade Fruit Rolls Ups - 1 ingredient! Easy Homemade Fruit Rolls Ups - 1 ingredient! Olivia's first day of 1st grade is tomorrow and naturally, I'm frantically preparing stuff for lunches. I do not buy any prepackaged lunch snacks. I'm frankly horrified by the ingredients in most of them and none of it resembles anything in my pantry or refrigerator. 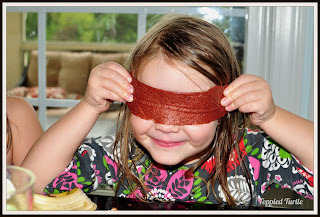 Fruit roll ups are probably some of the worst of them, so we make our own. These are so very simple, take about 10 minutes of prep, and require only ONE ingredient - you guessed it! Fruit! About 6 cups of cut up fruit - any fruit will do! I like to mix fruits together. 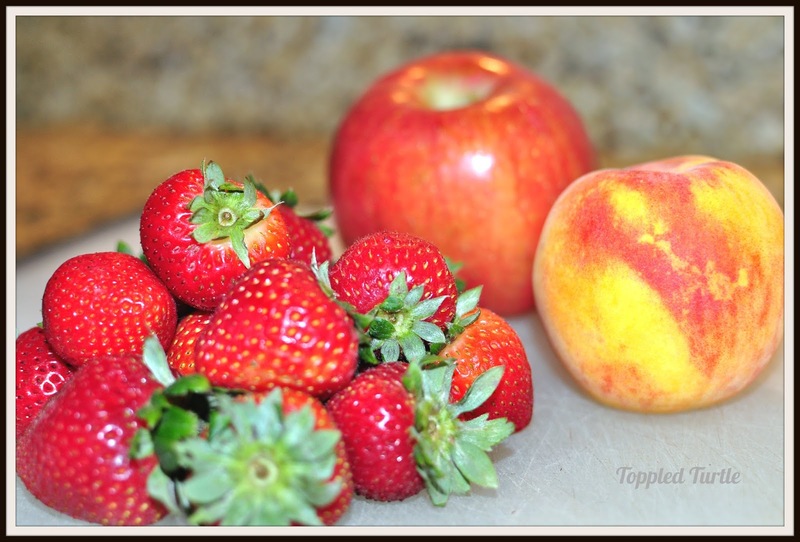 Today I'm making apple, peach, strawberry roll ups. I usually like to start with an apple or pear as a base and then toss in whatever else is in the fridge (citrus notwithstanding). 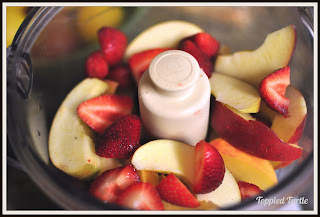 This is a terrific way to use up fruit when you've overbought or have just forgotten about some fruit you bought last week. Oh, come on - it's happened to you before too, hasn't it?! Optional: Cinnamon. Its good for you, it really is! But, I'm not the biggest fan of it. I like to make a few batches now and again with a sprinkle of it thrown in for something different. Optional: Agave Nectar or Honey. 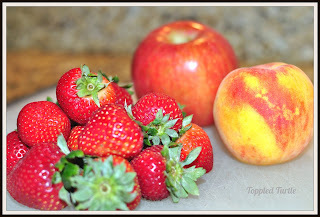 To be honest, I rarely add this, but there are times when I've been duped by beautiful looking fruit only to cut into it and realize its way too tart or not ripe enough. A tablespoon of agave or honey helps mellow that out. 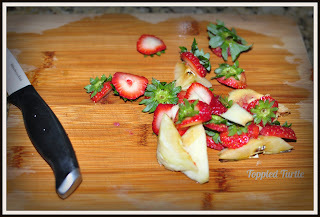 Step 1: Cut up fruit, remove seeds/pits and throw it all into the food processor. You'll need about 6 cups. I don't recommend any more than that per batch because its just too thick and takes a really long time to cook down. See all that beautiful fruit? Don't bother taking the time to skin the fruit - it takes up time (and who has any extra of that laying around) and the skin is loaded with nutrients, like the all-important fiber! This is my only waste. Can you hear my compost bin singing?! Step 2: Puree it, baby! Don't worry too much about getting every last chunk of fruit. 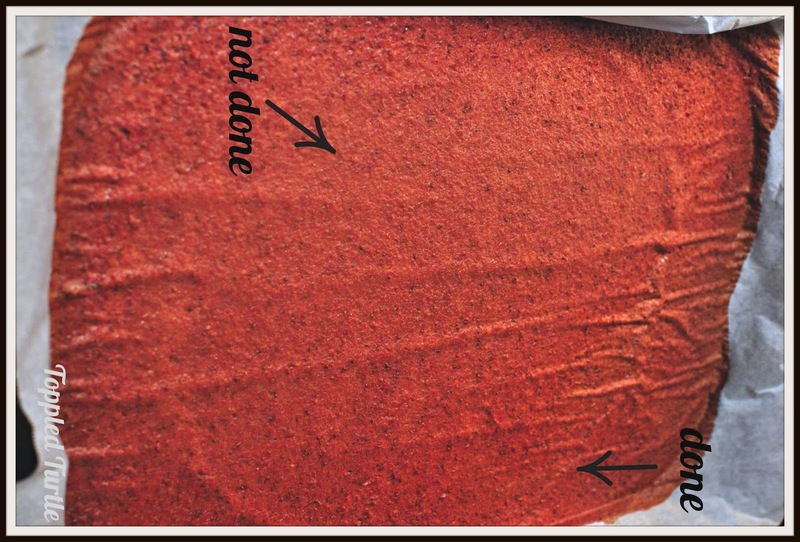 So long as its mostly pureed, you're good to go! Step 3: Line a cookie sheet (ahem: jelly roll pan) with parchment paper. A little trick I've learned is to lay the parchment paper so the curve from being on a roll is placed downward and then go along the edges of the pan and gently crease the paper along those lines. This makes it much easier to manage since the paper isn't fighting you nearly as much. Step 4: Spread your puree over the parchment paper as evenly as possible. Then, give the whole pan a little shake to help even it out some more. 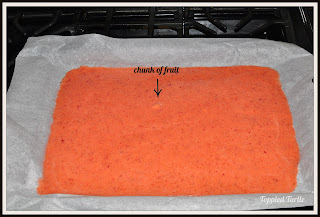 See how the parchment paper folds over the edges of the pan rather than rolling up toward the puree? See the chunk of fruit I found when spreading my mixture? 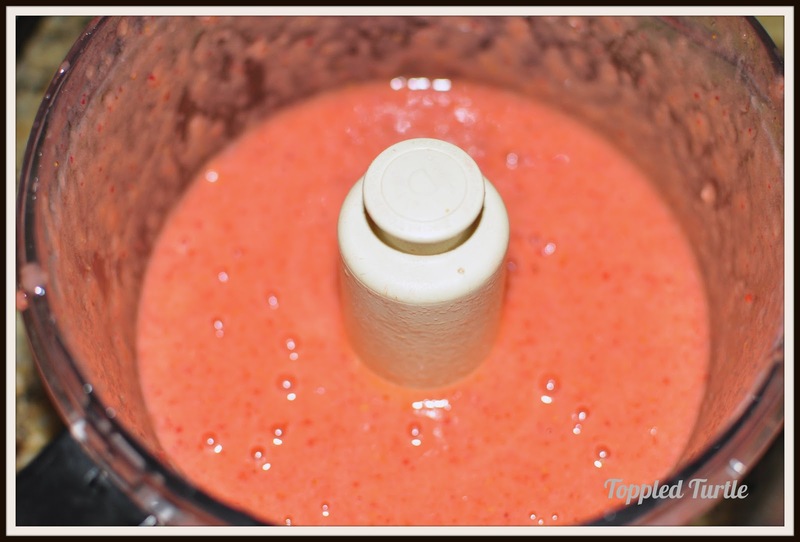 I told you it didn't have to be perfectly pureed! Step 5: Pop that pan into the oven on the LOWEST setting possible. My oven's lowest temp is 170 degrees. Now, walk away for a minimum of 4 hrs. Go run errands, clean your house, read a book, knit a sweater, just let them be. Trust me, you won't forget about them because your house will start to smell heavenly! After 4 hrs, I start checking on them. Each batch is different and when I start to see that the edges are getting done, I like to transfer my pan to the warming drawer on medium or high. This allows them to cook much more slowly and decreases the odds that you'll end up with what we lovingly call "fruit crisps." My children gobble these up just the same, but if that's not my goal, I'd rather not end up with that outcome. I typically move the pan to my warming drawer after 4-5 hrs and cook for several more hours in the warming drawer. If you don't have a warming drawer to transfer them to, you will now need to start checking on them every hour. Now, I need to stop here and explain a little something. Have you seen any of those Pinterest pins with perfectly uniform, beautifully portioned homemade fruit roll ups? I'm going to let you in on a secret....they're lying to you. I know, right?! Unless you have some magical power to spread the mixture perfectly even and a magical oven that cooks everything perfectly evenly, you will not get an entire batch of roll ups to look like that. Don't fret, perfectionism is overrated. See what I mean? Some of it is done and some of it is nowhere near done! Isn't this a pretty little roll? Notice I'm only showing you one - I don't want you to get any crazy ideas about all of my rolls looking like they've rolled out of a factory because its nowhere near the result you'll get. Step 7: Roll and store in the fridge. Do me (and the environment) a favor and don't bother trying to perfectly cut slips of parchment paper to roll these things up onto. Its a) completely unnecessary - if they're fully cooked, they won't be very sticky, b) a waste of resources - that unnecessary paper you spent your hard earned money on is going into the trash after having served no useful purpose other than to mimic a store bought roll up, and c) a waste of time - again, who's got lots of that to waste away?! Yes, her hair is wet because she *just* had a bath. And, yes, she's happily putting food on her face. *Sigh* Kids! After 4-5 hrs, or when the edges are starting to get done, transfer pan to warming drawer on medium or high for several more hours. If no warming drawer, start checking on mixture every hour. Use a pizza wheel to slice of strips as they get done. Roll strips and store in the refrigerator.